CodeMash was, once again, a huge success. For those of you who don’t know, it’s a cross technology, cross platform, cross discipline that is help in January in Sandusky, OH at an indoor water park. The meme is that we are there to Mash not Bash. Everyone is expected and encouraged to go learn about new technologies and bring new and fresh ideas back to their own shops and technologies. We had 375 people show including attendees, speakers, sponsors and so on. That’s a big growth over last year. It’s big enough that we are trying to figure out what to do next year with marketing because we’re not sure if we’d loose the vibe and the close contact that the 375 person conference affords. It was a much more mature vibe this year than last year. In it’s inaugural year (2007), it was interesting hanging out at lunch, dinner and the bar at night meeting new people and making new friends. However, on the first night there was a lot of trepidation and anxiousness as people were really unsure as to how or if they should really talk to everyone else. By the end of the conference there were interesting conversations happening between the PHP, Python, Ruby, .NET and Java guys. 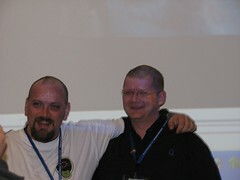 Brian Prince and I even shaved our heads as an incentive to get people to blog about the conference. Steven Harmon described the conference well when he called it the “biggest-little-conference around’. The type of person that CodeMash attracts is that top developer who is fascinated by technology and is desperate to expand their horizons and learn more. It’s not surprising that great consulting companies like Quick Solutions and SRT Solutions are at the very center of the conference doing much of the heavy lifting organizing and running the conference. In true CodeMash fashion, I did a talk on the DLR based on the great work by Jim Hugunin and John Lam. I covered a little bit of IronPython and even did demos with IronRuby. I ran out of time before I did all the demos that I wanted to do, like doing WPF with IronRuby, ASP.NET with IronPython and so on. It was great, however, to have Joe O’Brien in the room to help me with the semantics of Ruby and dynamic languages. Joe O’Brien is a guy that I met last year at CodeMash and we’ve since become really good friends and are working on getting together on eRubyCon (The Enterprise Ruby Conference). Hopefully I’ll see you there this year. It was a fun conference last year with a very CodeMashish type vibe. I’m really hoping that we get to do another fishbowl style talk at some point there. Oh and did I mention that they doubled the size of the water park? 🙂 My one regret this year was that I didn’t book over to Sunday with my family. the past two years my family has joined me on Friday evening and we’ve stayed until they kick us out on Saturday. Next year, I’m booking over to Sunday! I didn’t spend nearly enough time at the water park. Some of the guys (Yes, I’m talking about you James) went to the water park every day for multiple hours. Plans for next year, I’m going to continue my work with the DLR and hope to have a much more advanced talk that includes Silverlight 2.0 and maybe even a demo on Moonlight. 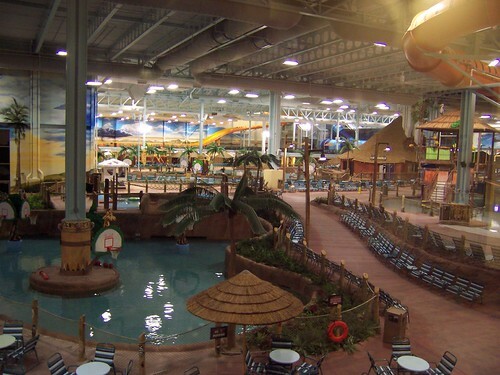 I’m also planning to spend more time at the water park on Day 0 and on the weekend. I have a hard time spending the conference time at the park because there are so many cool sessions and people to talk to. I’m going to do more podcasting. I really missed an opportunity here and only caught one interview with Joe Brinkman about DotNetNuke and working on an Open Source Project full time (check out http://www.codetolive.net soon). And hopefully, I’ll see you there!